It's been a while since I reviewed an album that I found on Noisetrade.com, simply because I hadn't visited the website for a while. To make amends in the coming weeks there will feature some albums from artists I found there recently. The first one is an artist who advertises himself as a lover of God. So that's a new one on this blog. I already found out that Noisetrade is a place where several religion inspired albums are released. Some are toe-bendingly bad or irritating, because the message is so obvious (and the music below average). This is different for James Thrasher. His religion does not get in the way of making some very pleasant songs. Better, some of his songs are as intricate as the cover art of this EP. All small lines of ballpoint colours creating waves, air and clouds at sunset (or dawn). The fingerpicking patterns match the detailed cover. Not so much virtuosity as an accurateness reached through hard work and dedication. The string picking on 'Sabotage' match these lines completely. From coolness to warmth, changing moods. Where the electric guitar is the darkness coming in and the acoustic guitar the (fading) light that is leaving. It is especially in 'Sabotage' that James Thrasher shows what he is capable of and the highlight of Life of seas. That is not to take anything away from the other songs. 'Sabotage' is just Thrasher's most mature song and worked out the best, although opening song 'Ocean' comes close. When listening to the other songs you will find that several are much barer. One instrument, a voice and background voices. The communality between all is that these songs are serious songs. Even when James Thrasher sings of his love for a girl in 'Hey girl'. Even when this love is played in an upbeat Jack Johnson style. Even when love is sung in a bare folk style, in 'As one', with just a mandoline (well, two. One left, one right), it is a serious matter. As far as I'm concerned this is what I like about James Thrasher. It gives Life of seas an edge that I enjoy listening to. James Thrasher has what I would call a mature voice. It has depth, is dark in sound, has the possibility to enrich it with a layer of emotion and still is completely natural in sound. At the same time he would not really have to outdo himself to be the singer in a grunge band. Life of seas could not be further apart from grunge though. Listening to 'The quiet' it is possible to imagine him singing to me in the room. There is no distance between his voice and the listener. The same goes for the song opening Life of seas, 'Ocean'. The song starts very subdued. During the song James Thrasher gains confidence and volume. The playful lead guitar does the rest. Life of seas is an album about relationships. An album about love and loving someone. If this album is written with one person in mind, this person can be quite happy and proud. 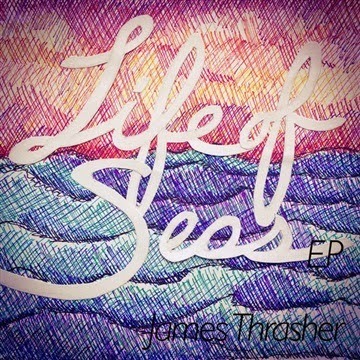 Life of seas may only be a six song EP, the album is mature, took me through several moods and shows that James Thrasher is a singer-songwriter with potential. Worthwhile to check out and you can.